Siamese are inquisitive, loving, playful and can be wary of strangers which is a good thing in this climate of pet stealing. I choose my cats carefully and have imported three boys from the USA to increase the bloodlines of our cats. If inbreeding is not good for humans why should it be different for cats. The boys I have in partnership with Sialaxy Siamese are Sandypoints Sir Alexi and Stonearch Harry. I recently imported Sandypoints Risisng Sun for myself. This boy has a paternal grandmother that came to the USA directly from a Siamese cattery in Thailand. I met Sandy Engle, owner of Sandypoints cattery when I travelled to the US for the tica annual show in 2011 We had the same values for the Siamese/ Thai. 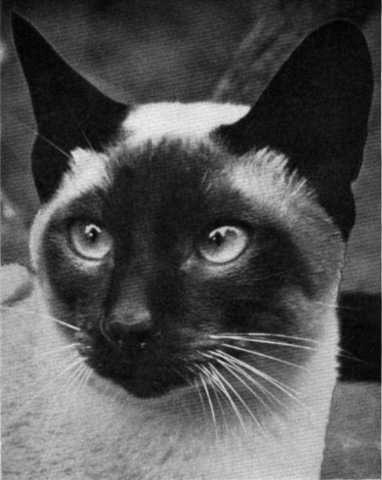 Tica have renamed the old style siamese as a Thai to enable breeders to show their cats. This is confusing in the UK as the GCCF have allowed the Lilac Korat to be named Thai. In Europe and north America the old style is Siamese/ Thai,,,only the UK are different. Judges with GCCF call our cats pet quality modern type which is so wrong, our cats are the original cats. I feed my cats a variety of food and they do eat a lot of raw. We must not forget that cats are obligate carnivors and must eat fresh meat to extract taurine, an amino acid they need but cannot make themselves. When my kittens leave they are eating a variety of food as I realise not everyone has access to raw game,,,rabbit, pigeon etc. They live in the house and stud cats live outside because of territorial spraying. Their cabins are heated and they have access to a fully enclosed garden. I give my cats a good quality of life, if they are happy so am I. I test for PRA, Progressive Retinal Atrophy and I have only one carrier in the cattery and that is Stonearch Harry. All my girls are negative so Harry poses no problem. I do allow my boys outside ladies but only from breeders committed to the old style and also registered with GCCF as a prefix cattery. Breeding is not a science, we intervene and put our cats to who we think is suitable. It is a learning curve on how to pick the best points from two cats to produce something better than themselves. The only reason to breed is to further and improve your chosen breed. I am not here to churn out kittens. My girls have three littens, the first is the new pairing, second is continuity and third is to keep a girl back and neuter the mummy. My queens are retired and placed in homes, usually with a kitten from final mating. I have put two photos on here. The first is a cat named Clonlost Yoyo born in the 40s who for me looks the perfect Siamese I am aiming to breed, the second is a photo of 8 week old kittens fighting over the torso of a rabbit. We must not forget that pretty little Siamese are carnivors. © Wicca Cats. All rights reserved.